Browse content similar to 10/03/2017. Check below for episodes and series from the same categories and more! courses. We will be live at the head teachers' conference in Birmingham. doubt about how strong their grievances are. to around ?70,000 every year, year on year. parents, informing them of the impact. had to cut GCSE or vocational courses in the last 12 months. schools should operate in these straitened times. are expected to continue delivering quality. to make cuts to the curriculum and it is untenable. there is a feeling that the separation has already begun. foundation stone of the European unit. clear about the future cost of access to EU markets. understands that and that is the reality. citizens who wanted to retain their EU identity. continue to have a relationship with the European Union. Brexit will have been replaced by the reality of tough negotiations. worth all of this extended political pain. Thank you. at the expensive of rivals like Sky, TalkTalk and Vodafone. Here's our technology correspondent Rory Cellan-Jones. completely and seems content with today's deal. what we are doing with the fundamental reforms today. that the roll-out will accelerate and service will improve. up behind bars. Steve Evans in Seoul. National cycling Centre, tell us about what is in the document? also a duty of care to athletes and Stav. Thank you. Classes in England are going up, say headteachers. but air pollution in the capital is again a huge issue. in Britain's cities, and how to achieve cleaner air. The Great Smog of 1952, dramatised in the Netflix series The Crown. Anne Goldsmith was eight in 1952 and remembers it well. the handkerchief would be absolutely black. It's now thought 12,000 people died in the Great Smog. The enemy then - coal, used in factories and people's homes. What followed the smog was the Clean Air Act of 1956.
to replace the diesel engines in 65 taxis. We removed 99% of the nox that the taxi was producing. There are hundreds of taxis in Birmingham. the action that is needed to address the need for clean air in the city. Well, I'm afraid the Government's been hopeless. You have to phase diesel vehicles off our roads. But it would cost a fortune, wouldn't it? indoors at playtime, just as Anne was in 1952. Sometimes, we have to stay inside because the air is bad. as he coached his daughters to become tennis stars. and punched one of his daughters after a tennis match. Our correspondent, Helena Lee, is at Snaresbrook Crown Court. Crown Court, which continues. Thank you. with England playing Scotland in the Calcutta Cup at Twickenham. Katherine Downes is at the Millennium Stadium. Championship cannot be won this weekend, it can certainly be lost. the match kicks off at 8:05pm also on BBC One. Thanks very much. which has just reached its highest ever world rankings. done for over 30 years - beat England at Twickenham. Here's our sports correspondent, Joe Wilson. Rugby union was strictly an amateur sport. That really was one of the great Calcutta Cup tries! as he does now, and the spirit of '83 lingers. I still see, you know, a lot of the guys that I played with. you always feel up against it a wee bit, you know. In adversity, you know, that maketh the man. So, yeah, I think the spirit will be there in aplenty. In Scotland, that figure's around 49,000. This season, Scotland have already beaten Ireland and Wales. If you can't go through your opponents, you can dodge round them. Two chances, two scores, two tries for Scotland! asset which will enable you to win tonight? and we keep our heads up the paddock and see what's coming. Well, back in '83, power ballads were the rage. but if Scotland beat England here, they could win the Six Nations. the UK is alive with the sound of live music. But what does it tell us about our musical likes and dislikes? a look - and a listen - to the music scene in Glasgow. In our cars, at home, on our phones, we listen to plenty of music. records, digital downloads and streaming combined. it's a fundamental part of being part of the human species. Glasgow has a really active music scene. Some smaller, more intimate, venues are only just breaking even. forms brings joy to many is already beyond doubt. Now, you know that saying about how showbiz and children don't mix? of his children decided to make a guest appearance. Not to be upstaged, along came child number two. Followed very, very, quickly by a harassed mum! nobody noticed. Well, not many millions of people, anyway! That she had a lot of people this morning. looks like we will get at least a bit of rain. Back to you. being scrapped and class sizes going up. That's all from the BBC News at One, so it's goodbye from me. 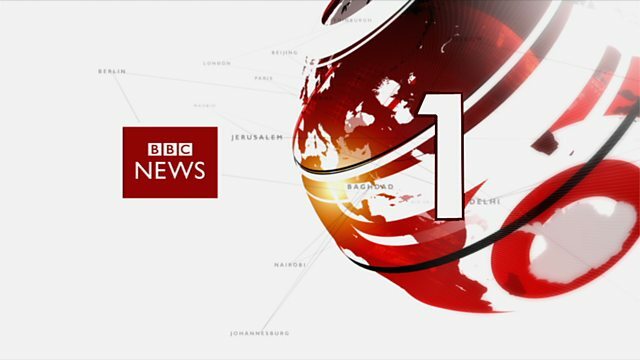 And on BBC One, we now join the BBC's news teams where you are.